Hanley Ramírez (born December 23, 1983) is a Dominican-American professional baseball infielder and designated hitter in the Cleveland Indians organization. He has played in Major League Baseball (MLB) for the Boston Red Sox, Florida / Miami Marlins, Los Angeles Dodgers, and Cleveland Indians. Ramírez is a three-time MLB All-Star, and received the 2006 National League Rookie of the Year Award. Ramírez established himself as an elite threat at the plate over his prime years, with a high career batting average (.290) and a high isolated power (.198). However, he was rated a poor defensive shortstop, which is why when he returned to the Red Sox the team played him in left field for the first time in his career, with even poorer results. For the 2016 season, he was switched to the first base position, a move that yielded good results both offensively and defensively. His hitting declined in 2017 and 2018, as he had the lowest batting average and the lowest OPS of his MLB career. Ramírez was born in Samaná, Dominican Republic, to Toribio and Isabela Ramírez. His father was an auto mechanic. At an early age, Ramírez was an avid baseball fan and showed great potential to make it in the sport as a MLB prospect. He was also known as a basketball player. He attended Adventista High School in Samaná, and was a great player attracting the attention of MLB scouts. Boston Red Sox scout Levy Ochoa recognized Ramírez's talent and signed him to the Red Sox in 2000. Ramírez signed with the Boston Red Sox as an international free agent in July 2000, at age 16. He played in the Dominican Summer League for the DSL Red Sox in 2001. In 2002, with the GCL Red Sox he hit .340 and was selected as a Gulf Coast League and Rookie League All-Star. He also batted .371 in 22 games with the Class A Short Season Lowell Spinners that year. Ramírez spent 2003 with the Class A Augusta GreenJackets, batting .275 in 111 games. In 2004, he split time across the GCL Red Sox (batting .400 in 6 games), the Class A-Advanced Sarasota Red Sox (.310 in 62 games), and the Double-A Portland Sea Dogs (.310 in 32 games). Ramírez was rated by Baseball America as the number ten prospect in baseball prior to the 2005 season, and with the Sea Dogs that year he was selected as an Eastern League All-Star while hitting .271 in 122 games. Ramírez made his MLB debut on September 20, 2005, against the Tampa Bay Devil Rays, entering the game as a defensive replacement in the bottom of the seventh inning and then striking out in his first at bat in the top of the eighth inning against Tim Corcoran. Ramírez appeared in only one other game that season, striking out again in one at bat. After the 2005 season, the Red Sox traded Ramírez and Aníbal Sánchez, Jesús Delgado, and Harvey García for Josh Beckett, Mike Lowell and Guillermo Mota. During spring training, Ramírez was impressive enough to earn the starting shortstop job over Robert Andino. On April 3, he recorded his first Major League hit in his first at bat of the season, a single to center field off of Houston Astros pitcher Roy Oswalt. On April 18, he led off the game with his first Major League home run off of Eric Milton of the Cincinnati Reds. He hit his second home run in the seventh inning of that game against reliever Mike Burns. Ramírez led all MLB rookies with 185 hits, 119 runs, 11 triples and 51 stolen bases. He hit seven leadoff home runs, the most in team history for a season and career. Ramírez's 46 doubles in the 2006 season is the all-time NL record for a shortstop age 22 or younger. He is the first NL rookie to post 110-plus runs and 50-plus stolen bases. He became the fifth big-league player since 1900 to hit 45-plus doubles and have 50-plus stolen bases, joining Ty Cobb, Tris Speaker and Lou Brock. He finished the season as the NL Rookie of the Year Award named by the Baseball Writers' Association of America. During his sophomore season, Ramírez picked up where he left off. The ever-improving young star, who referred to Ryan Howard when asked about the sophomore jinx in baseball, was hitting .331 with 14 home runs and 35 RBIs to go along with 27 steals at the All-Star break. Despite his numbers, he did not make the All-Star roster. Marlins manager Fredi González experimented with Ramírez a bit in the number three slot in the lineup, batting him ahead of Mike Jacobs when injuries hit the Marlins position players. Gonzalez believed Ramírez could be a middle-of-the-lineup player despite his speed, because he hit for power. In a game versus the Cincinnati Reds on July 22, 2007 Ramírez overextended his shoulder when he tried to hit a pitch on the lower outside corner off right-hander Bronson Arroyo. He was helped off the field and was determined to have suffered a partial dislocation of his left shoulder. In 154 games Ramírez batted .332 with 29 home runs, 81 RBIs, 125 runs and 51 steals. He fell one home run shy of becoming only the third player in baseball history to hit 30 or more home runs and steal 50 or more bases in the same season. Ramírez led the National League in VORP. After the end of the season, Ramírez underwent arthroscopic surgery to repair his injured left shoulder. Entering the 2008 season, Ramírez was now looked at as the face of the franchise after the Marlins traded All-Stars Miguel Cabrera and Dontrelle Willis to the Detroit Tigers. Ramírez contributed well in the Marlins fast start, earning a spot as the starting shortstop for the National League All-Star team for the first time in his career. He was 2-for-3 with two singles and a run in the 2008 All-Star Game. In addition, Ramírez agreed to a six-year, $70 million extension, by far making it the richest contract in Marlins history. Ramírez was named NL Player of the Month in June. He had been batting .298 with six doubles, a triple and ten home runs. He led the NL in three categories: home runs, runs scored and total bases. Ramírez hit his 30th home run of the season on September 13 and joined Preston Wilson in 2000 as the only Marlins to become members of the 30–30 club. He ended the season with 33 home runs and 35 stolen bases. Ramírez played in the World Baseball Classic for his native Dominican Republic prior to the 2009 season. During the April 6, 2009 regular season opener against the Washington Nationals, Ramírez hit his first career grand-slam off of Washington reliever Steven Shell. On July 5, 2009, Ramírez was the NL starting shortstop for the 2009 All-Star Game. On September 6, against the Nationals, Ramírez hit his 100th home run of his MLB career, becoming the fourth quickest shortstop in terms of games played to reach that milestone (Alex Rodriguez, Nomar Garciaparra, and Ernie Banks). With a batting average of .342, Ramírez won his first batting title. He recorded 106 RBIs (sixth in NL), stole 27 bases (fifth in NL), and scored 101 times (eighth in NL). He won the Silver Slugger Award at shortstop, and came in second to Albert Pujols for NL MVP. On May 17 in a home game versus the Arizona Diamondbacks, Ramírez fouled a ball off his ankle in his first at-bat. He looked as if he was in some pain but remained in the game. He then grounded into a double play to end the inning as he slowly ran to first base. The next inning, with runners on first and second, a bloop shot was sent into shallow left field. Ramírez ran to catch it. He did not, and when it hit the ground, Ramírez inadvertently kicked it into the left-field corner. Ramírez then jogged all the way to the corner as Diamondbacks rounded the bases. Two of the three runners would end up scoring with the other ending up on third. Then-manager of the Marlins Fredi González removed Ramírez from the game, and a war of words led to Ramírez being benched for the next game. In his first game back against the St. Louis Cardinals, Ramírez went 3–for-5 with a RBI. About a month later, Gonzalez was fired. Ramírez was voted in as a starter for the 2010 All Star game for the third year in a row. He was also chosen to participate in the State Farm Home Run Derby for the first time in his career. In the Derby, he came in second place to Boston's David Ortiz. Ramírez hit his 25th career leadoff home run and his first career walk-off hit on August 7 against the St. Louis Cardinals. He came up to bat in the bottom of the 10th inning with a man on first base hit a walk-off double to right-center field to end the Marlins' five-game losing streak. On September 15 in a game against the Philadelphia Phillies, Ramírez aggravated an injury in his elbow he sustained earlier in the season while swinging. He attempted to come back and play a week later, but after one game, he was still in pain and shut down for the rest of the season. He finished 2010 with a .300 batting average, 21 home runs, 76 RBIs, 32 steals and 92 runs scored. During the 2011 season, Ramírez performed below levels seen in recent seasons. By June 20, Ramírez was hitting just .200 with only 4 home runs and 17 RBIs. However, he raised his stats up to .243 with 8 home runs and 37 RBIs by July 9. For the first time in his career, Ramírez hit cleanup. He injured himself after trying to make a diving catch in a game against the New York Mets on August 2, aggravating a shoulder injury that plagued him in 2010. He missed the rest of 2011, playing only 92 games, and needed surgery in the off-season. He finished the season batting .243, 10 HR, and 45 RBIs. The Marlins, who were 55–55 at the time of the injury, finished 72–90. During the 2011–2012 off-season the Marlins, during their rebuilding stage, acquired reigning the National League batting champ shortstop José Reyes. Prior to that signing, Ramírez was the shortstop. After the signing, reports circulated claiming that Ramírez was unhappy with being forced to change positions to third base. After a slow start, Ramírez finished strong in May with 11 home runs and 37 RBIs. On July 13, 2012, Ramírez dropped in the batting order from second to fifth to start the second half of the baseball season. On July 25, 2012, Ramírez was traded to the Los Angeles Dodgers together with Randy Choate for Nathan Eovaldi and minor league pitching prospect Scott McGough. At the time of his trade, Ramírez was batting .246 with 14 home runs and 48 RBIs and had recorded 14 stolen bases. In his debut with the Dodgers, Ramírez hit a triple in his first at-bat. He went 2-for-4 with a RBI, and a run in a losing effort against the St. Louis Cardinals. He hit his first home run for the Dodgers on July 27, winning the game in extra innings in Game 1 of a series with the San Francisco Giants. In 64 games, he hit .271 with 10 homers and 44 RBIs. He had three walk-off hits in 2012, the most in MLB. Ramírez with the Los Angeles Dodgers in April 2013. He played with the Dominican team during the 2013 World Baseball Classic. In the championship game against Puerto Rico he injured his hand while diving for a ball. An MRI the next day revealed a torn thumb ligament which would require surgery. The Dodgers announced that he would miss the first two months of the season while recovering, however, he rejoined the Dodgers on April 29, earlier than expected. In just his third start after returning, Ramírez suffered a hamstring injury while running the bases on May 3 and returned to the disabled list. He eventually rejoined the Dodgers on June 4. His return from the disabled list reignited the Dodgers offense and they started to get hot, which included a 46-10 record from mid-June to mid-August and they went from last place to winning the National League West. Ramírez, in just 86 games, hit .345 with 20 home runs and 57 RBI and reached the playoffs for the first time in his career. In the 2013 National League Division Series against the Atlanta Braves, Ramírez went 8 for 16 with six extra-base hits, tying a franchise postseason record. In Game 1 of the 2013 National League Championship Series, Ramírez was hit by a fastball on a 1-2 count in the first inning, fracturing two ribs and taking him out of the series, which the Dodgers lost in six games. In the last year of his contract, Ramírez dealt with several injuries throughout the season. He finished the regular season hitting .283, with 13 home runs and 71 RBIs in 128 games. On August 2, Ramírez hit his first career walk-off home run off of the Cubs' Blake Parker in the 12th inning. He became a free agent after the season, even though the Dodgers did extend a qualifying offer to him. Hanley Ramírez cost starting pitcher Clayton Kershaw a perfect game on June 18. Committing a throwing error in the top of the seventh inning. Ramírez has had a history of committing errors. Manager Don Mattingly removed Ramírez from the game and replaced him with Carlos Triunfel. On November 25, 2014, Ramírez signed a four-year, $88 million deal with a fifth year vesting option worth $22 million, to return to the Boston Red Sox. They announced plans to play him in left field, even though he had only previously played shortstop and third base in his career. Ramírez talking with umpire Will Little. On Opening Day 2015 on April 6, in his first game with Boston in almost 10 years, Ramírez played left field for the first time in his career and hit two home runs (one being a broken-bat grand slam) for a total of 5 RBI as the Red Sox routed the Philadelphia Phillies 8–0. On April 29, Ramírez hit his 10th home run of the season, joining teammate David Ortiz as the only players in Red Sox history to hit 10 home runs in the month of April. However, a few days later on May 4, Ramírez left the game against the Tampa Bay Rays in the top of the first inning after crashing into the left field wall at Fenway Park. The team announced shortly after that he had suffered a left shoulder sprain. Ramírez ended the 2015 season with a .249 batting average and 19 home runs in 401 at-bats, as his defensive rating in left field was rated as the worst in the American League. As a result, on September 1 the Red Sox announced Ramírez would not play left field for the remainder of the season. The Red Sox also announced then that Ramírez would again change positions in 2016, as its starting first baseman, a new position that he never played before. Ramírez reported early to 2016 spring training with the Red Sox and dismissed his impending positional switch to first base as nothing hard. Once the season began, the transition was well received by the press and clubhouse, with praise going to his improved defense and greater comfort in the infield. On July 20, 2016, Ramírez belted three two-run home runs in Boston's 11–7 interleague play victory against the San Francisco Giants at Fenway Park. Then on August 12, he hit a pair of three-run home runs as the Red Sox beat the visiting Arizona Diamondbacks, 9–4, in an interleague game. It was his 20th career multihomer game, while his six runs batted in matched a career-high. On September 15, 2016, in perhaps the most memorable at bat of his season, Ramírez hit a walk off three-run home run to stun the Yankees and complete a thrilling come from behind victory. The win would help catapult the Red Sox to an eleven-game win streak and eventually the 2016 AL East crown. On October 2, 2016, Ramírez hit his 30th home run of the season. Ramírez, Mookie Betts and David Ortiz became the first trio in Red Sox history with 30 home runs and more than 100 RBIs in the same season. Ramírez would finish the season with a .286 batting average and 111 RBI, a new career high. With the retirement of David Ortiz and the offseason addition of first baseman Mitch Moreland, Ramírez took on the role as the designated hitter for the Red Sox. He had his lowest major league batting average ever as part of a .242/.320/.429 slash line, with 23 home runs, 62 RBIs, and one stolen base (the lowest total of his career) while coming in fourth in the league with eight intentional walks, and playing only 18 games in the field (all at first base). In the postseason, Ramírez batted 8-for-14 (.571) in the 2017 ALDS as the Red Sox lost to the eventual World Series champions, the Houston Astros. In 2018, Ramírez batted .330 for the month of April, but struggled in May, batting .163. On May 25, Ramírez was designated for assignment by the Red Sox as the team activated Dustin Pedroia from the disabled list. He was released on May 30. In 2018, he had a career-low 177 at bats, in which he batted .254 with a career-low .708 OPS. Overall, in Ramírez's second stint with the Red Sox (2015–18), he batted .260 with 78 home runs and 255 RBIs in 429 games. His salary in 2018 was $22 million. On February 26, 2019, Ramírez signed a minor league contract with the Cleveland Indians, which includes an invitation to the Indians' 2019 major league spring training camp. The Indians purchased Ramírez's contract on March 28, 2019. The Indians designated Ramírez for assignment on April 20, 2019. Ramírez and his wife, Sanoe (Elisabeth), have three children. Ramírez enjoys reggae music and DJing, as well as listening to merengue and bachata music. He maintains a close friendship with former teammate and fellow Dominican David Ortiz. On April 5, 2019, Hanley became a naturalized United States citizen. ^ a b "Hanley Ramirez". Fangraphs. Archived from the original on December 31, 2014. Retrieved November 24, 2014. ^ "wRC and wRC+". Fangraphs. Archived from the original on September 11, 2014. Retrieved November 24, 2014. ^ "ISO". Fangraphs. Archived from the original on July 28, 2014. Retrieved November 24, 2014. ^ "K% and BB%". Archived from the original on July 28, 2014. Retrieved November 24, 2014. ^ "Hanley Ramirez; Advanced Fielding". Fangraphs. Archived from the original on July 29, 2014. Retrieved November 22, 2014. ^ "UZR". Fangraphs. Archived from the original on July 21, 2014. Retrieved November 22, 2014. ^ Saxon, Mark (March 13, 2014). "Teams are starting to exploit Hanley's defense". ESPN.com. Archived from the original on May 12, 2014. Retrieved November 22, 2014. ^ Hernandez, Dylan (February 15, 2013). 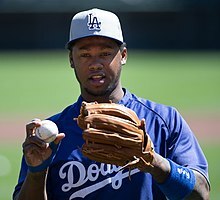 "Dodgers' Hanley Ramirez is working to improve his defense". Los Angeles Times. Archived from the original on February 26, 2013. Retrieved November 22, 2014. ^ "Hanley Ramirez's Rock-Solid Defense At First Base Big Plus For Red Sox". NESN. April 12, 2016. Retrieved May 5, 2016. ^ a b Rodriguez, Tania (2013). Superstars of Baseball: Hanley Ramirez. Broomall, Pennsylvania: Harding House Publishing Services, Inc. p. 9. ASIN B00O4HNYSK. Retrieved April 21, 2015. ^ a b "Hanley Ramirez". Baseball-Reference.com. 2014. Retrieved January 6, 2015. ^ Crasnick, Jerry (April 21, 2015). "Breaking down how five players who changed positions are faring". ESPN. Retrieved April 21, 2015. ^ Doyle, Ricky (December 2, 2014). "Xander Bogaerts Similar To Young Hanley Ramirez, Red Sox Coach Says". NESN. Retrieved July 16, 2018. ^ Magee, Brandon (May 29, 2015). "Minor League Report 5/29/15 – Dominican Summer League Begins". sonsofsamhorn.com. Retrieved July 16, 2018. ^ "Baseball Cube". Baseball Cube. December 23, 1983. Archived from the original on November 13, 2013. Retrieved August 27, 2013. ^ "Boston Red Sox 15, Tampa Bay Devil Rays 2". Retrosheet. September 20, 2005. Retrieved August 27, 2013. ^ "Boston Red Sox 10, New York Yankees 1". Retrosheet. October 2, 2005. Retrieved August 27, 2013. ^ "Red Sox complete deal for Beckett, Lowell". Espn.com. November 25, 2005. Retrieved May 25, 2018. ^ "April 3, 2006 Marlins vs. Astros box score". Baseball-Reference.com. April 3, 2006. Archived from the original on September 18, 2013. Retrieved August 27, 2013. ^ "April 18, 2006 Marlins vs. Reds box score". Baseball-Reference.com. April 18, 2006. Archived from the original on September 17, 2013. Retrieved August 27, 2013. ^ Rojas, Enrique (November 13, 2006). "Ramirez becomes second Marlin to win award". ESPN.com. Archived from the original on March 18, 2014. Retrieved November 27, 2008. ^ Frisaro, Joe (May 22, 2007). "Big bat Hanley returns to leadoff spot Marlins shortshop hits for power but struggled batting third". MLB.com. Archived from the original on November 6, 2012. Retrieved November 27, 2008. ^ "Ramirez has arthroscopic shoulder surgery". ESPN.com. Associated Press. October 3, 2007. Archived from the original on November 6, 2012. Retrieved November 27, 2008. ^ Frisaro, Joe (May 16, 2008). "Details of Hanley's contract revealed Star shortstop's extension to be richest deal in Marlins history". MLB.com. Archived from the original on June 5, 2011. Retrieved November 27, 2008. ^ Fagen, Faran (July 2, 2008). "Ramirez named NL Player of the Month Marlins shortstop hit 10 homers and scored 27 runs in June". MLB.com. Archived from the original on March 24, 2012. Retrieved November 27, 2008. ^ a b Edes, Gordon (April 7, 2015). "Hanley Ramirez, Dancing with the Star". ESPN. Retrieved April 7, 2015. ^ "Hanley Ramirez to accept switch". ESPN. Associated Press. January 2, 2012. Archived from the original on April 15, 2012. Retrieved August 27, 2013. ^ Heyman, Jon. "Hanley talks great game, says he'll be best 3B". CBS Sports. Retrieved March 3, 2012. ^ Gurnick, Ken (July 25, 2012). "Source: Dodgers acquire Hanley from Marlins". MLB.com. Archived from the original on June 18, 2013. Retrieved July 25, 2012. 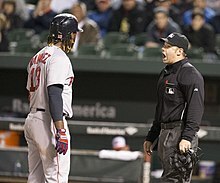 ^ "Hanley Ramirez Stats Summary at MLB.com". MLB.com. Retrieved July 25, 2012. ^ "Team Batting Event Finder: 2012, All Teams, Hits, Walk-off". Baseball Reference. Retrieved July 20, 2018. ^ "Needing surgery, Hanley likely out two months". MLB.com. March 21, 2013. Archived from the original on June 18, 2013. Retrieved August 27, 2013. ^ "Hanley returns as Kershaw goes on bereavement list". MLB.com. April 30, 2013. Archived from the original on June 18, 2013. Retrieved August 27, 2013. ^ "After hamstring injury, Hanley likely to DL". MLB.com. Archived from the original on October 4, 2013. Retrieved August 27, 2013. ^ Gurnick, Ken; Laymance, Austin (June 4, 2013). "Hanley returns to Dodgers, who place Capuano on DL". MLB.com. Archived from the original on June 8, 2013. ^ a b c Gurnick, Ken (February 12, 2014). "Pain-free Hanley wants to be 'Dodger for life'". MLB.com. Retrieved January 6, 2015. ^ Saxon, Mark (October 7, 2013). "Ramirez epitomizes Dodgers' talent". ESPN. Retrieved January 6, 2015. ^ Edes, Gordon (November 24, 2014). "Report: Red Sox set to add Ramirez". ESPN. Archived from the original on December 28, 2014. Retrieved November 24, 2014. ^ Browne, Ian. "Hanley, Pedroia power up against Phillies". MLB.com. Major League Baseball. Retrieved April 6, 2015. ^ Abraham, Peter (May 4, 2015). "Hanley Ramirez leaves game with sprained left shoulder". The Boston Globe. ^ Hanley Ramirez. "Yahoo! Sports". Sports.yahoo.com. Retrieved May 25, 2018. ^ "''Portland Press Herald''". Pressherald.com. September 1, 2015. Retrieved May 25, 2018. ^ Ramirez-to-first base experiment shaping up as success. CSN. Retrieved on August 13, 2016. ^ Ramirez homers twice, Red Sox beat Diamondbacks 9-4. ESPN. Retrieved on August 13, 2016. ^ Browne, Ian (June 8, 2014). "Hanley Ramirez hits walk-off homer vs. Yankees | Boston Red Sox". M.redsox.mlb.com. Retrieved May 25, 2018. ^ Blum, Sam. "Red Sox K record 11 straight, win 11th in row | MLB.com". M.mlb.com. Retrieved May 25, 2018. ^ Noll, Hunter (October 3, 2016). "Boston Red Sox powerful trio make franchise history". Outside Pitch Sports Network. Retrieved October 7, 2016. ^ "Hanley Ramirez". ESPN.com. Retrieved October 24, 2016. ^ "Hanley Ramirez Stats". Baseball-Reference.com. Retrieved May 25, 2018. ^ Speier, Alex (May 25, 2018). "Red Sox to part ways with Hanley Ramirez". Boston Globe. Retrieved May 25, 2018. ^ Cotillo, Chris (May 30, 2018). "Hanley Ramirez released: Boston Red Sox officially make first baseman a free agent". MassLive. ^ a b Varela, Ashley (June 22, 2018). "Report: Hanley Ramirez "eyed" in federal and state investigation". NBC Sports. ^ Bell, Mandy (February 26, 2019). "Hanley, Tribe complete Minor League deal". MLB.com. MLB.com. Retrieved February 26, 2019. ^ "Hanley Ramirez's wife Elisabeth Ramirez". MLB.com. September 24, 2014. Retrieved January 6, 2015. 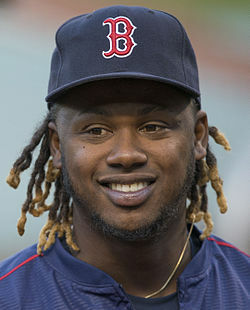 ^ "Hanley Ramírez welcomes second son". Celebrity Babies. February 29, 2012. Retrieved August 27, 2013. ^ "Welcome to the Family | by David Ortiz and Hanley Ramirez". Theplayerstribune.com. Retrieved May 25, 2018. ^ McIntosh, Whitney; Stephen, Eric (June 24, 2018). "Hanley Ramirez name dropped but not involved in federal and state drug investigation". SB Nation. Retrieved February 25, 2019. ^ Mandy Bell (April 5, 2019). "Santana, Hanley pass U.S. citizenship test". MLB.com. Retrieved April 11, 2019. Wikimedia Commons has media related to Hanley Ramírez. Schoenfield, David (May 25, 2018). "Why the Red Sox parted ways with Hanley Ramirez". ESPN. Retrieved May 27, 2018. This page was last edited on 20 April 2019, at 18:54 (UTC).